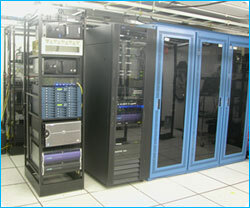 AcerHosting Data Center Facility is a mainframe-type raised floor environment hardened to provide the maximum level of security and availability. The Data Center is housed in one of Atlanta's premiere Carrier Hotels and has 24-hour on-premises electronic security and guard services. The computer room is appropriately secured for authorized personnel only. The Data Center has redundant Liebert air conditioning systems sized for the BTU requirements of the space. A Halon fire protection system provides maximum security from fire. All power supplied to the computer room is provided through a UPS system with automatic on premises generator back-up. The entire facility is served by two separate power substations from Georgia Power. The substations provide buried, concrete encased power lines to the building. AcerHosting has multiple GigE connections to international backbones to ensure uptime. These connections are provided by Telia-Sonera, Level III Communications and Cogent Communications. We also have 80 Gbs capacity of dark fiber connected to the main POP in the Southeastern United States, TELEX's Marietta 55, giving us access to over one hundred national and regional providers. AcerHosting has over 15,000 square feet of available Data Center space connected directly across the street to the Marietta 56 Carrier Hotel. ATLDC has over 12 Gigabits of capacity, and the ability to ramp to 80 Gigabits upon demand. Copyright © 2008. AcerHosting. All rights reserved.